This week's challenge at Create with Connie & Mary is a color challenge - and what refreshing colors they are: Pool Party; Whisper White and Silver Glimmer. I wanted to get as far away from Christmas cards as I could so decided to go for a clean and fresh gift card holder that would be suitable for a birthday or wedding. 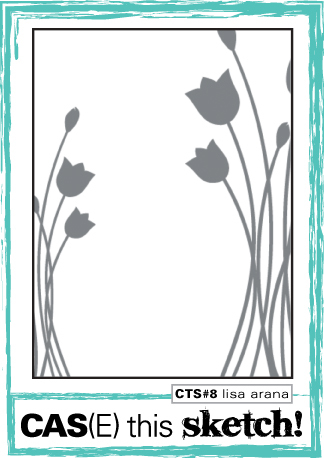 I used an old gift card holder as my template, so I don't have a link for you, but there are plenty of them around in blogland if you are interested. 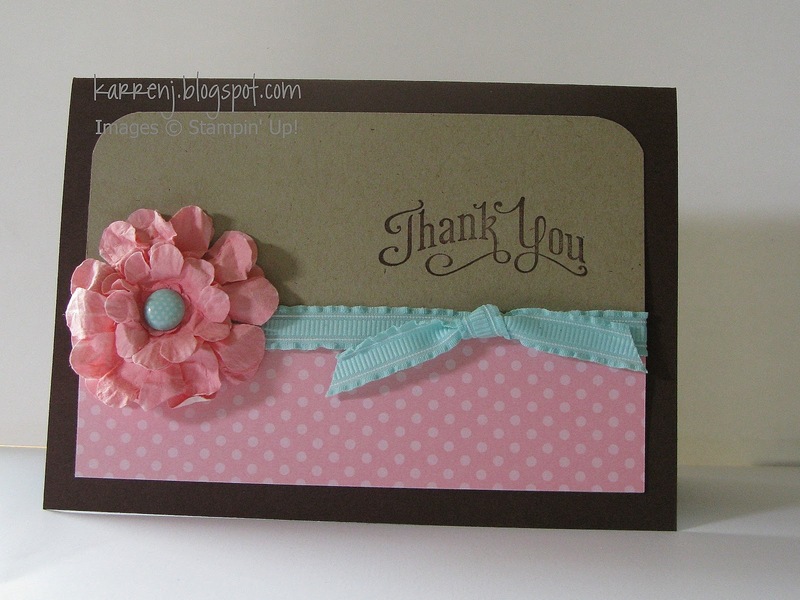 I stamped the vine stamp from Creative Elements onto the front using Pool Party ink. A little heart punched out of silver glimmer paper finishes the base. The belly band is also very simple - Whisper White with a layer of Pool Party DSP. 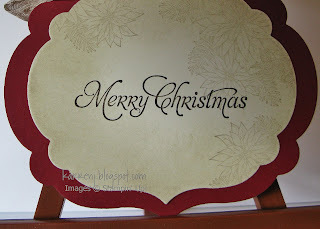 The greeting is from the Apothecary Accents framelits and I paper pierced an oval around the sentiment. A couple of rhinestones finishes it off. Thanks for looking. 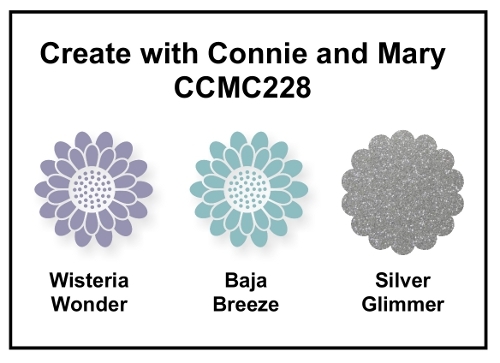 Head on over to Create with Connie & Mary to see what the rest of the challenge team has come up with and give these colors a go. 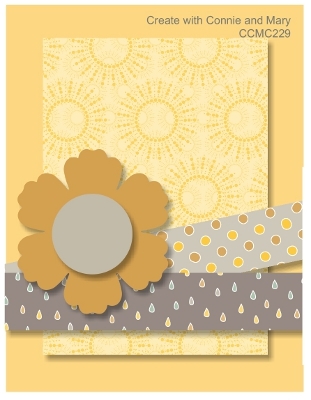 I had a bit of time today to do some card-making, so made a card for the Freshly Made Sketch challenge. I am preparing this blog post on my older son's laptop as my younger son accidentally spilt my mug of green tea over my laptop. Consequently, I've sent my laptop to rehab to dry out (ie it's on its side on the counter-top) and hope it will boot up and work okay in a couple of days. So if things look a bit different it's because I don't have any of my normal photo editing programs on this laptop so having to make do. I took a few liberties with the sketch this week - swapping the circle for an oval and also substituting the Island Indigo brads for the rectangular panel. The arrow is cut out and popped up on dimensionals. It's been two weeks since I've had a chance to sit down and make a card (my design team card posted the other day was made some weeks ago), but it's my DH's 50th birthday tomorrow (yes, Christmas Eve!) so I thought I'd better make the time to produce a card for him. 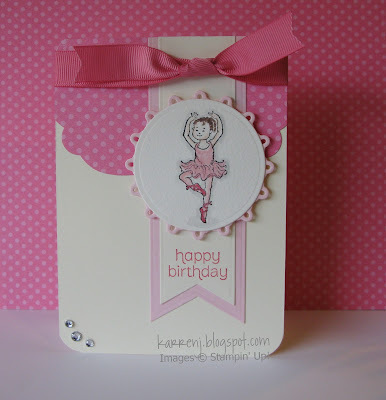 A few days ago, I saw the coolest cards on Becky Roberts blog and knew I had to try it for myself using a birthday theme. There are so many stray embossing specks on this card that under other circumstances, I wouldn't blog it and wouldn't gift it, but I'm fast running out of time. So we'll just pretend the specks are meant to be there right? LOL. For all that, this was a fun card to make and without a doubt I used more stamp sets on this card than any I've made before. I hope Pete likes it. I started out thinking I could put all my stamps on the biggest clear block and stamp in one hit, but it left big gaps between each image so I had to resort to the single image system. 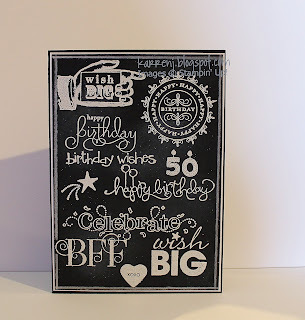 For each image, I stamped onto my Stamp-a-majig image sheet using Crumb Cake ink, then cleaned the stamp, swiped the cardstock with my embossing buddy and re-stamped using Versarmark. I heat embossed each image before moving onto the next one. Once all the images were stamped, I inked up a tissue with Whisper White ink and rubbed it onto different parts of the card. I then went around the outside with a whitepencil and rule. Wanna hear something really bad? Five of these images had to be mounted before I could use them - and all five are retired sets...!! 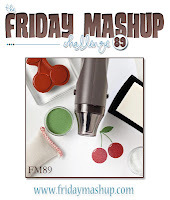 I'm entering this in this week's Friday Mashup challenge, which is to use heat embossing (big tick!) 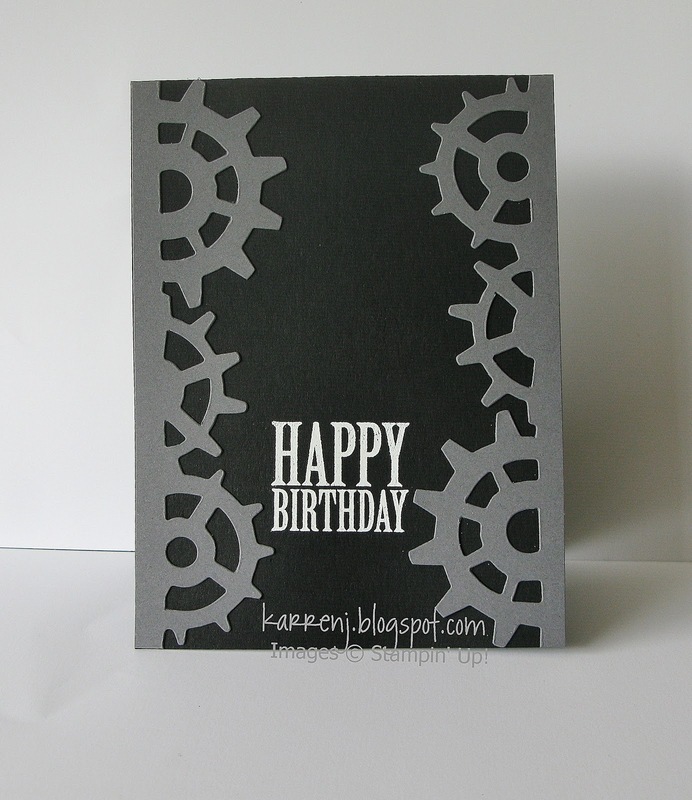 or a CAS card and I suppose this qualifies although it was anything but clean and simple to produce! I stuck pretty faithfully to the sketch and produced what I hope is my last Christmas card for this year! 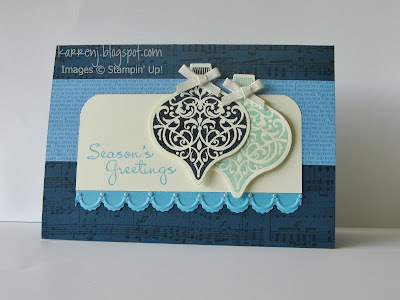 For this card, I used Watercolor Winter for my stamp set and the beautiful Candlelight Christmas DSP. The ribbon is Cherry Cobbler Seam Binding ribbon which is gathered by pulling a thread down the center. Thanks for looking. 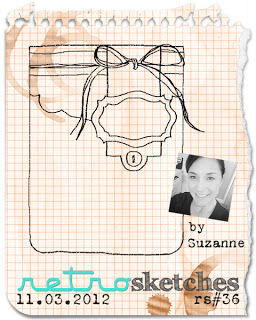 Now go check out the rest of the challenge team's submissions and give the sketch a try. Hi and welcome to another challenge for Create with Connie & Mary. 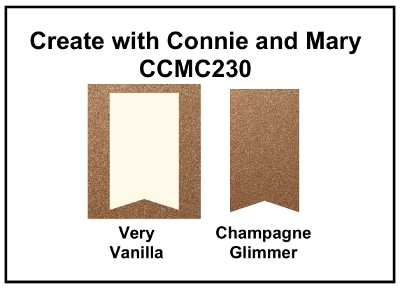 This week it's a color challenge - Very Vanilla and Champagne Glimmer Paper. Very classy combo! I decided to skip Christmas for this challenge and head straight onto Valentine's Day. It's quite hard to tell from the photo, but the bottom heart is cut out of the Very Vanilla layer so you can see through to the Champagne Glimmer paper below. The vanilla layer is also popped up on dimensionals. A heart punched from the Full Heart Punch is layered on top again and to finish the card off, I've used some Very Vanilla 1/8" Taffeta Ribbon and a couple of little tags. Thanks for looking. 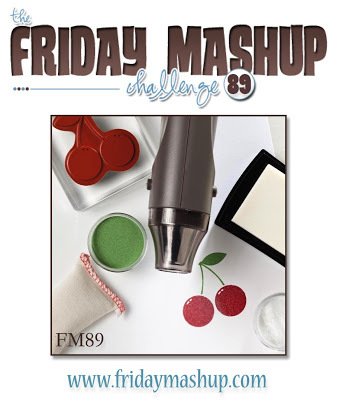 Head on over to Create With Connie & Mary and see what the rest of the challenge team has come up with. Here is a very quick and easy CAS card for the sketch challenge at CAS(e) this Sketch. I used some Tim Holtz dies cut in Basic Gray and the Happy Birthday is embossed in white. Told you it was quick and easy LOL. This card covers three separate challenges this week: Freshly Made Sketches; ColorQ and the monochromatic challenge at Hand Stamped Sentiments. 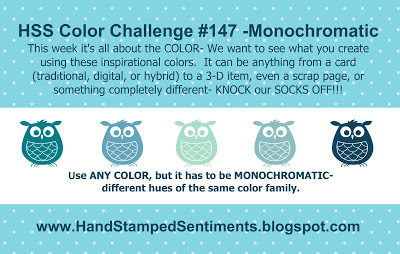 I haven't been able to play along at Hand Stamped Sentiments for ages, so it was serendipitous that the color challenge at ColorQ also met the criteria at Hand Stamped Sentiments. 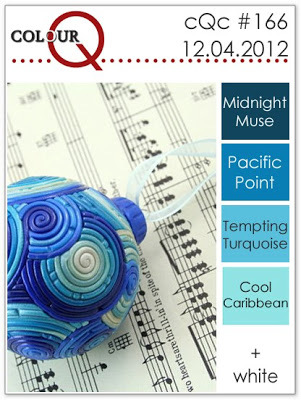 Both my ornaments are embossed in clear over Midnight Muse or Cool Caribbean ink. It's hard to see in the photo but above each little scallop is a tiny little pearl which I colored in a pale blue color. 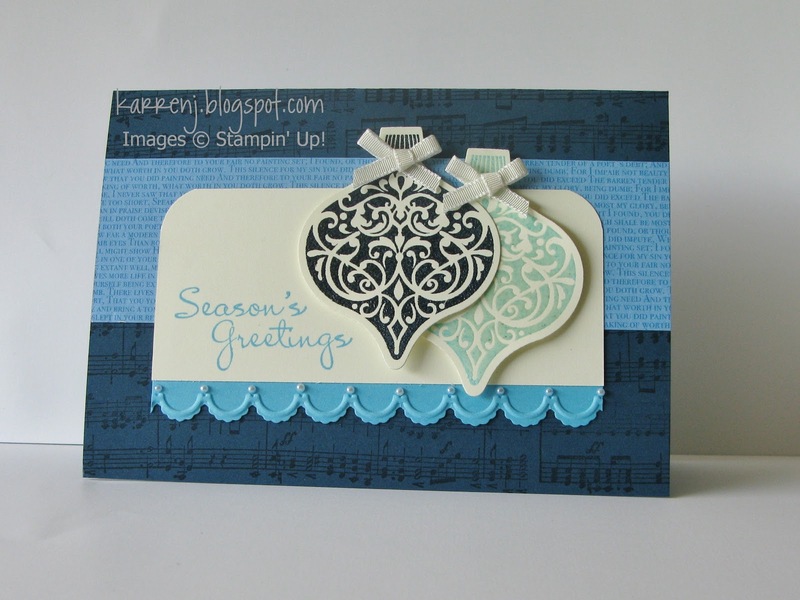 The music notes are inked in Midnight Muse onto the card base. The DSP layer is Pacific Point. 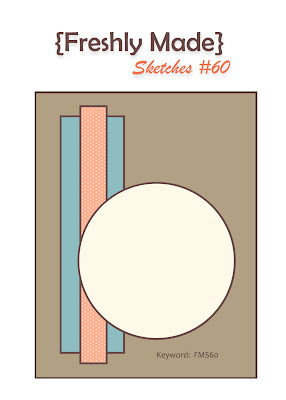 It's time for another sketch challenge over at Create with Connie & Mary and this one has heaps of possibilities. I decided to go Christmass-y (again!) with my card. My original intention was to have the large panel a masked/sponged panel but after several attempts where I botched it at the last minute, I gave up on that notion! Instead I went for a variation on the Triple Time Stamping technique, using only two layers. The final layers are cut with the Large Scallop Edgelit and paper pierced with the Essentials Paper Piercing Pack. The Midnight Muse ribbon is gathered at one spot and finished off with some rhinestones. 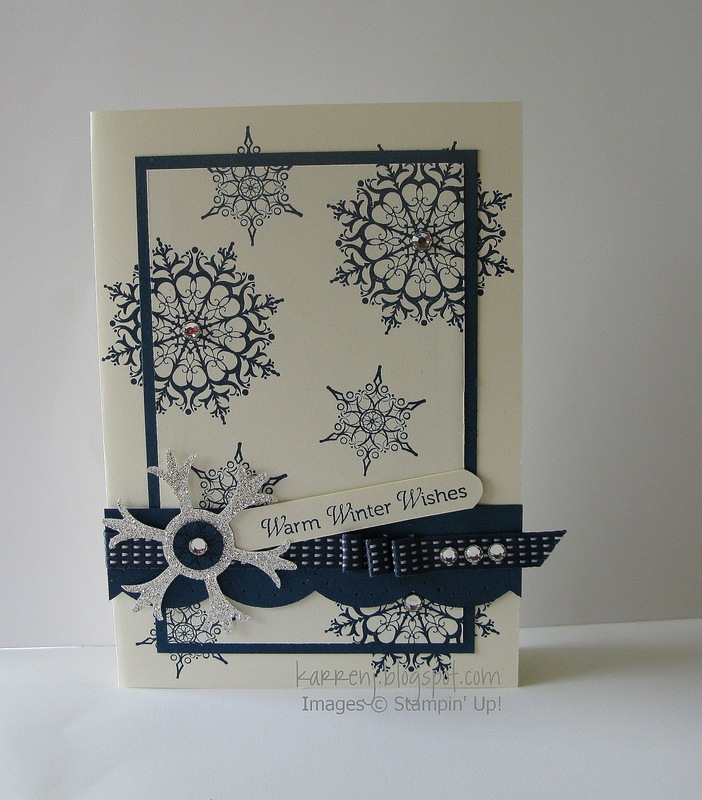 Rhinestones are also placed in the center of the big snowflakes. The sentiment is rounded using the oval punch. Head on over to Create with Connie & Mary to check out the rest of the design team cards and give the sketch a go - it's a fun sketch! This card is for the color challenge at Just Add Ink and the sketch challenge at Fab Friday. The flower is made using paper daisies colored with a Pretty in Pink marker. I'd been using the Pool Party Seam Binding ribbon so much, I'd completely forgotten about the gorgeous ruffled ribbon, so decided to use it here to provide a more elegant finish. Today in the Southern Hemisphere, it's my good friend Holly's birthday. Holly lives in the Northern Hemisphere so her birthday isn't really until tomorrow. But here is a virtual birthday card for Holly, whether it be today or tomorrow LOL. Happy Birthday, Holly! 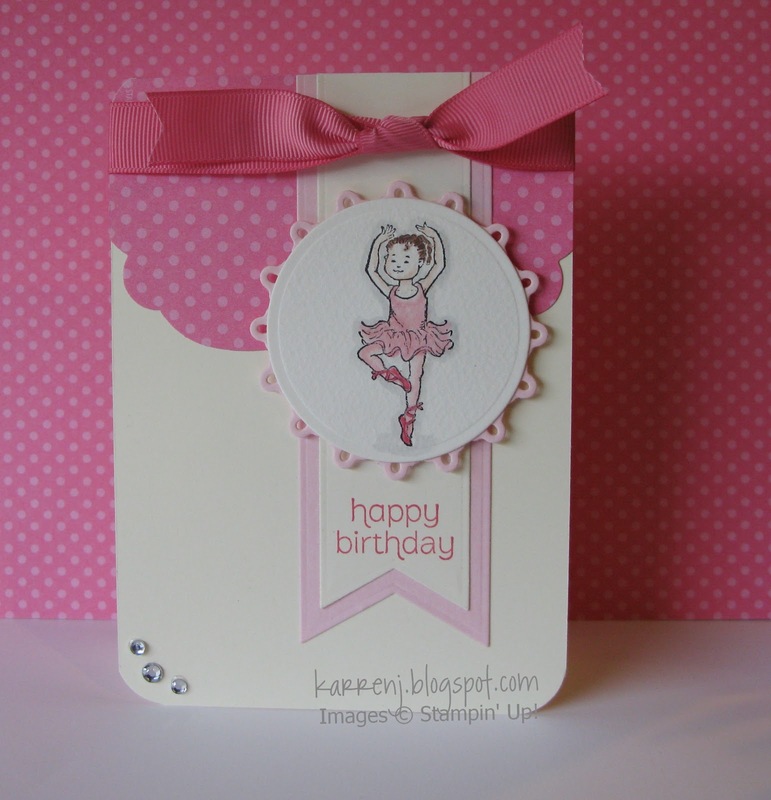 To help with the design of this card, I used the sketch from Freshly Made Sketches and the color challenge at Colour Me Beautiful. 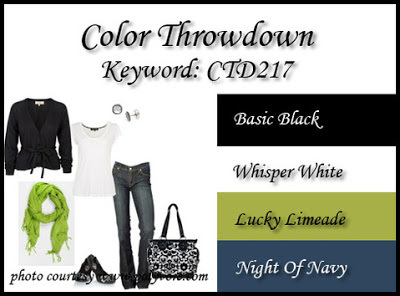 Unfortunately, this is the last color challenge from that site. While I haven't been able to play each week, I've really enjoyed the times I have played. It's pushed me out of my comfort zone to use more than 2-3 colors per card. So thanks, girls, for challenging me to try something different. 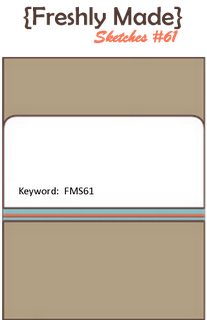 This card uses all five colors although you may be hard-pressed to see where. I brayered the EF with Crumb Cake ink before running it though with Sahara Sand cardstock. IRL it gives a bit more depth to the layer. The roses are stamped using Primrose Petals stamped off, then Rose Red full strength. The leaves are using Sahara Sand which has just enough of a green tinge to avoid looking completely weird! 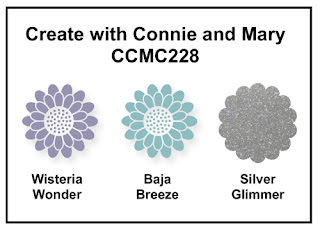 This week's challenge at Create with Connie & Mary is a color challenge and what cool colors! 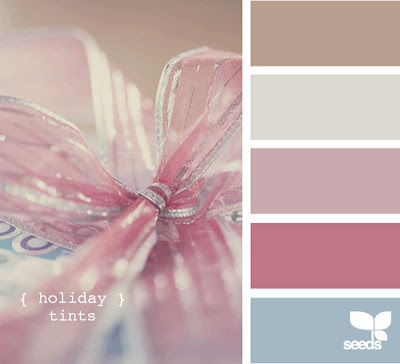 Baja Breeze, Wisteria Wonder and Silver Glimmer Paper. I'm not normally a fan of Wisteria Wonder, but it goes wonderfully with Baja Breeze and the sparkly Silver Glimmer paper. 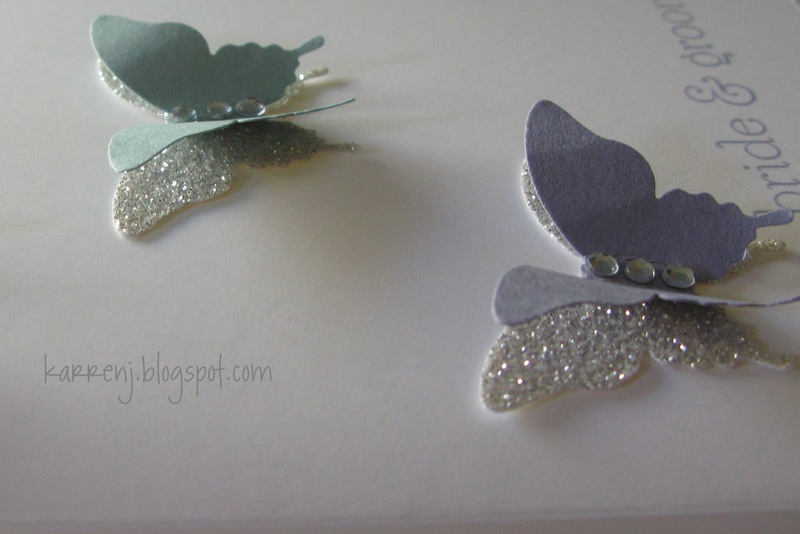 I saw a photo of gifts given to some European demos at their recent convention and one of the gifts had these gorgeous little butterflies using the new Elegant Butterfly punch and silver glimmer paper. So I just had to case the idea for my very CAS card. 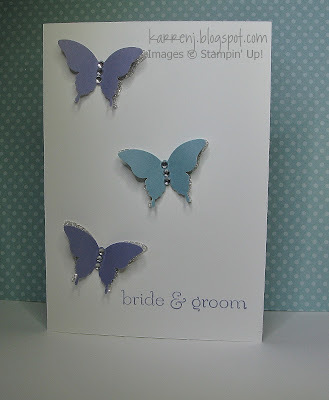 The silver glimmer butterfly is stuck onto the card base while the Wisteria Wonder and Baja Breeze butterflies and just stuck in the center with their wings pulled away from the sparkly layer. Here's a close-up of the butterflies. 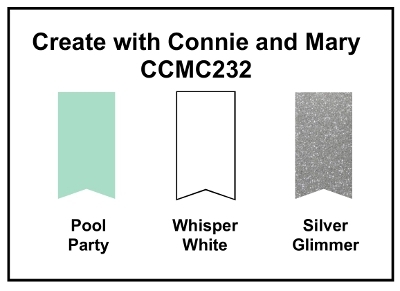 Head on over to Create with Connie & Mary and give this color challenge a go. 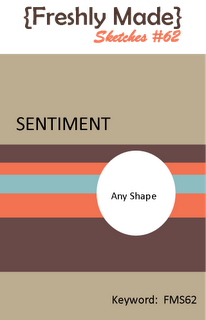 You can see the variety of cards created by the design team using this color scheme. This card covers three challenges: the color challenge at ColorQ; the sketch challenge at Just Add Ink and the Friday Mashup challenge. 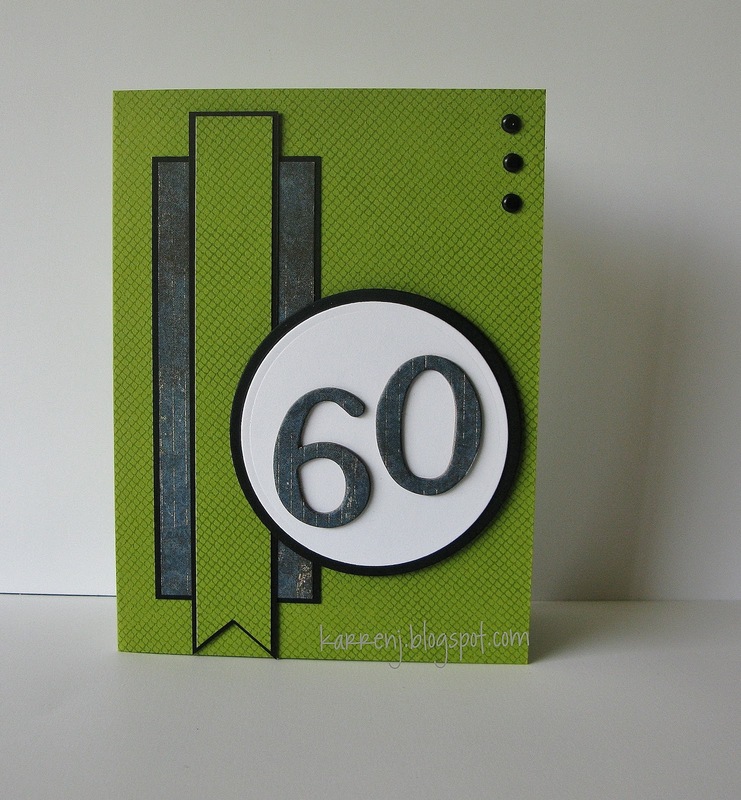 I saw a card on Kim Singdahlsen's blog where she used the Grunge Me set from PTI to make a very cool and retro-looking teenage birthday card. 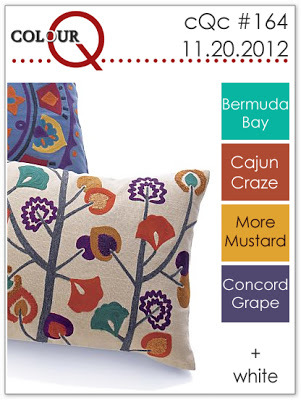 When I saw the colors at ColorQ this week, I immediately thought of Grunge Me as a way to incorporate these 4 colors. 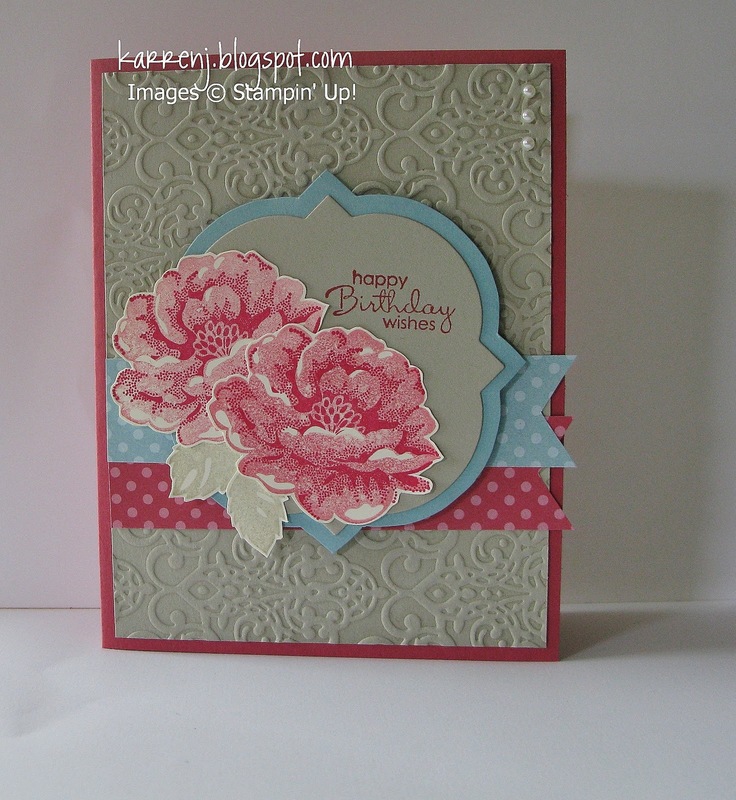 I used Kim's stamp layout as my inspiration. Thanks, Kim! This is one of my rare non-SU cards. 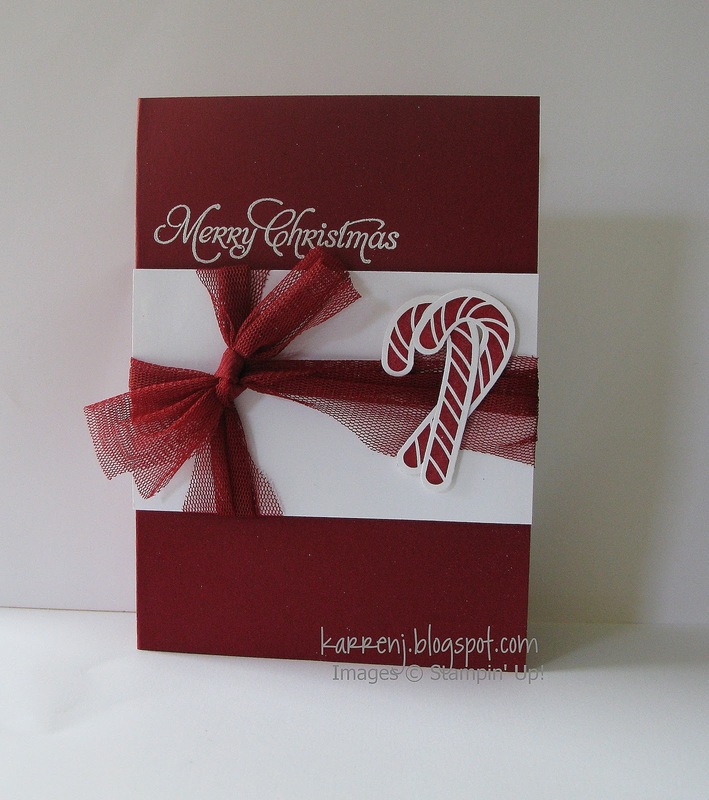 The challenge at Friday Mashup was to make a holiday card using non-holiday images or make a messy card. Obviously I didn't mash it up and instead focused on the messy aspect of the challenge, both using splatter stamps and the color spritzer tool to splatter both More Mustard and Concord Crush ink over the stamped images. The card base is Confetti White which has a textured, blotchy look to start with. I used Bermuda Bay and Concord Crush for the 2 panels, rounding one corner on each piece. Edited to add: This card got an Honorable Mention at Just Add Ink this week. 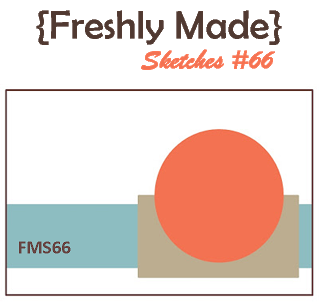 This week's sketch at Freshly Made Sketches is a goodie - very versatile. My final card was not how I imagined it would be but I'm happy with it anyway. My original intention was to put another layer on top of the white panel then wrap the tulle around the center, but when I started playing with the tulle, it looked like gift wrapping so I decided to leave it as it is. The candy canes are from the Scentsational Season set and matching framelits - my first time using them after having them for nearly 2 months. Thought I'd better use them before Christmas is over for another year LOL. All the specks on the card base are not stray bits of embossing powder - I sprayed the base with shimmer spray so it's all sparkly IRL. Edited to Add: This was chosen as a Perfect Princess card. 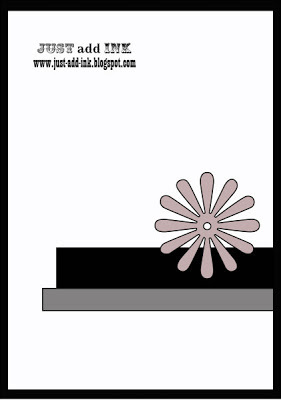 This card was intended for this week's challenge at Just Add Ink which is to add music. But either my world clock is wrong or they've closed off the linky tool early, and I've missed out. By my reckoning there is still 4 hours to go but never mind, here's my card anyway. 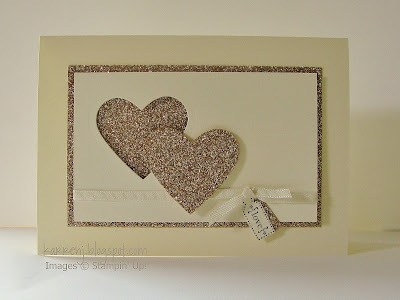 I went a bit shabby with this card, with lots of sponging; distressing and collage-stamping. I took my colors from the Attic Boutique DSP and topped it off with a shabby bow in Pool Party Seam Binding. Living in the Southern Hemisphere, Christmas is in the middle of summer. 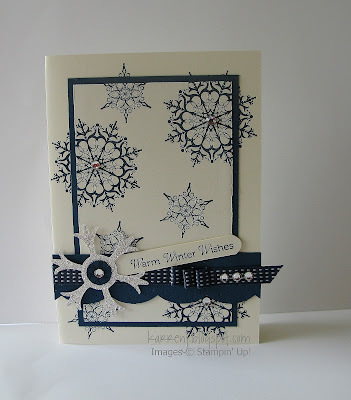 For all that, I love using winter/snow themes for my Christmas cards. Summer-themed Christmas cards are just not right LOL. 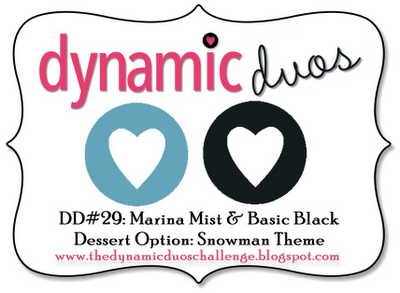 Anyway, the sketch challenge at Freshly Made Sketches and the color challenge at Dynamic Duos came together in my card this week. This card is definitely not one of my best, but for some reason I really struggled to either find time to stamp or create something decent this past weekend. 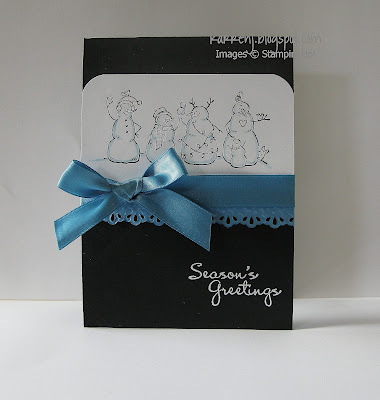 I stamped the Frosty Friends stamp onto Whisper White and then using a marker and blender pen, I highlighted the snowmen and snow with Marina Mist. The Marina Mist strip was dry embossed before being die cut with the Finishing Touches edgelit. The greeting is white-embossed. 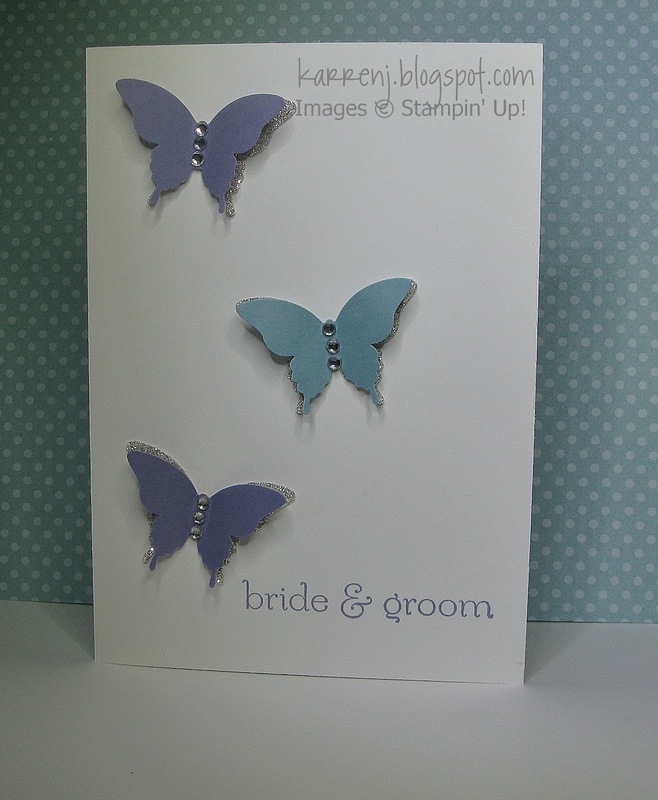 Marina Mist satin ribbon finishes off the card. Accessories: White EP; Marina Mist marker; blender pen; Finishing Touches Edgelit; Marina Mist satin ribbon. Well, this is quite an exciting post for me! 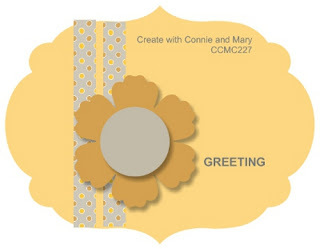 I was invited to join the design team at Create with Connie & Mary for the next 4 1/2 months. 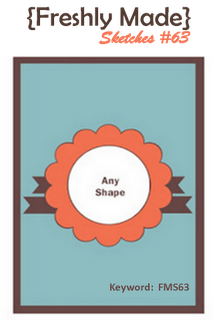 After the initial gulp, there was no way I was going to turn down the invitation and here is my first challenge - a shaped card. And here is my interpretation of it. I used the gorgeous Bells & Boughs set along with the Labels Collection Framelits to make this vintage-y Christmas card. 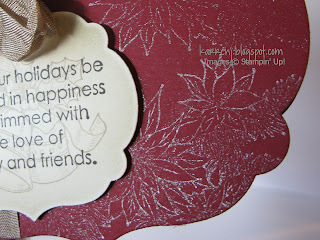 I stamped the bells image in Crumb Cake ink then over-stamped the sentiment in Early Espresso ink. After I cut out the image and before I removed the framelit, I sponged some Crumb Cake ink around the edges, leaving the center lighter. The card base is stamped using the gorgeous Illuminate Glimmer ink which is so much nicer in real life. For the inside I stamped the poinsettia image randomly in Crumb Cake and again sponged around the edges before removing the framelit. Here is a close-up of the Illuminate Glimmer ink. I finished the card off with a shabby bow using Crumb Cake Seam Binding Ribbon. Head on over to Create with Connie & Mary and try your own shaped card. 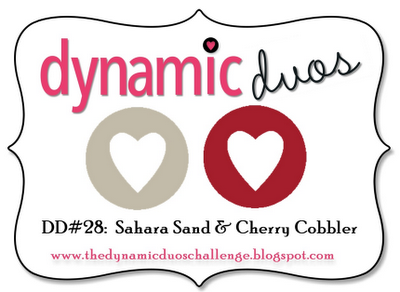 The color challenge this week at Dynamic Duos is Sahara Sand and Cherry Cobbler. Now, I think Sahara Sand is one of the most under-rated colors in the SU family, so I was quite happy to pair it up with one of my fave Regals colors - Cherry Cobbler. I sort of feel like I've cheated a bit here, because I cased this card I made months ago, but that's where my mind went when I saw the challenge and nothing was gonna budge it LOL. 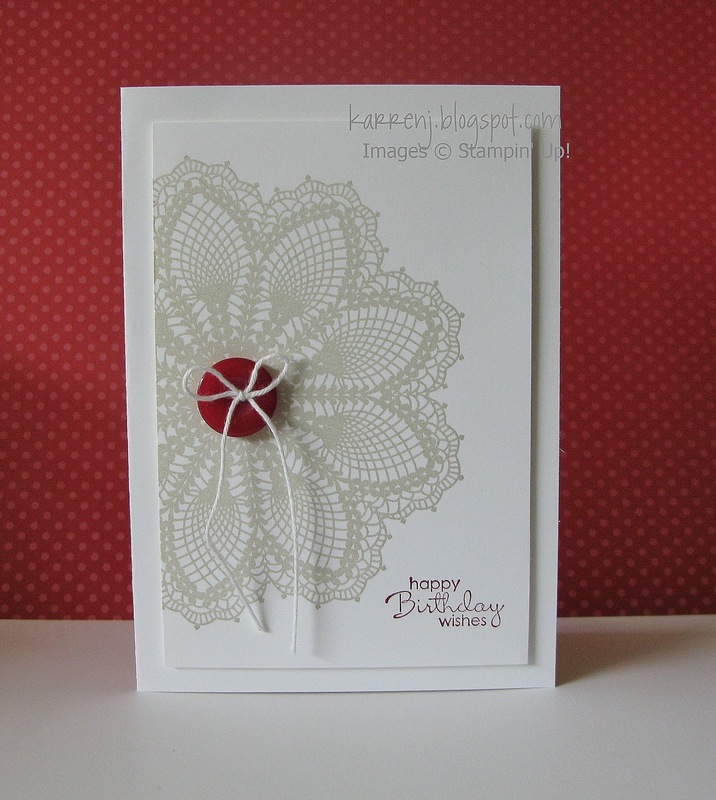 I used a brayer to ink up the Hello, Doily stamp to give even coverage. 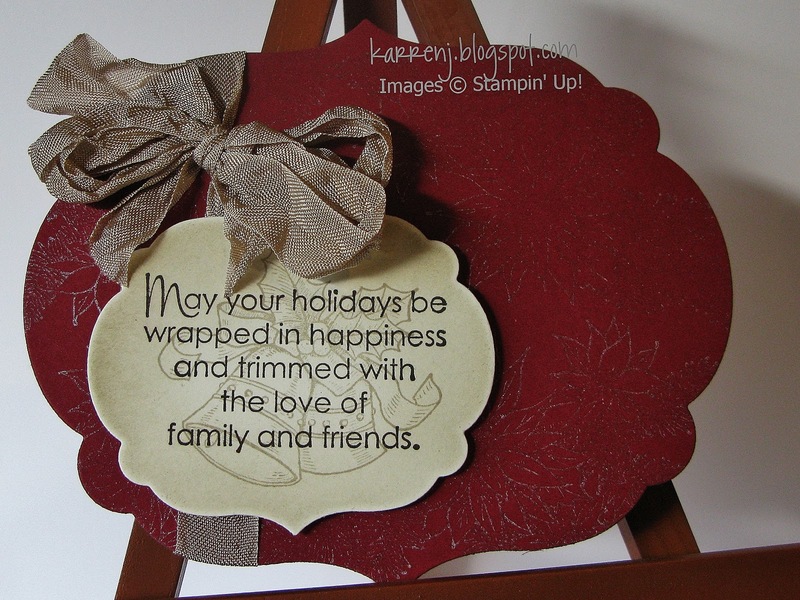 The sentiment is stamped with Cherry Cobbler ink and the card was finished off with a Cherry Cobbler button and white Baker's Twine. It is my niece's 7th birthday next week, so I thought I'd better get on to making her a card. Like a lot of little girls, she's into ballet so I pulled out an old, retired set called Tu-Tu Terrific. I used last week's sketch from Retro Sketches and went with the traditional girly pinks in my color scheme. Here's the sketch I worked from. Love this layout and can see me using it again. I kept the card reasonably plain as the recipient is a very down-to-earth guy - a true Kiwi bloke LOL. I love Lucky Limeade and Basic Black together - so stunning - so I made that the foundation of my card with a few accents of blue and white. 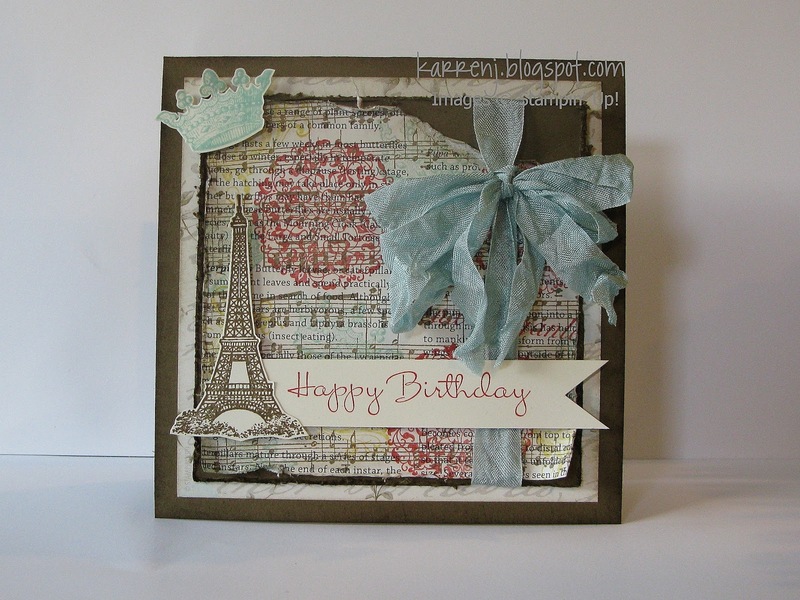 The background is the Netting background stamp which I also stamped onto the banner. The numerals were made from thick DSP backing board and DSP. The circles are popped up on dimensionals. Here in the Southern Hemisphere it's the middle of spring, but recent weather would make one think we're in Autumn again! 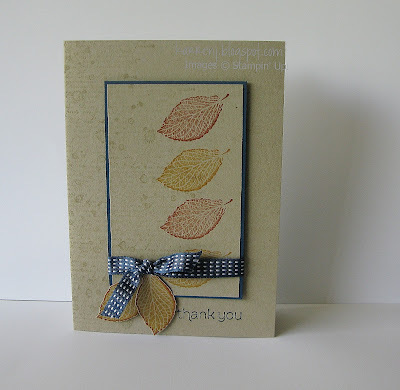 Here's a card I made for several challenges - the color challenge at Create with Connie & Mary; the Elegant Autumn challenge at SUO Challenges; and the Paper Players Challenge to give thanks. 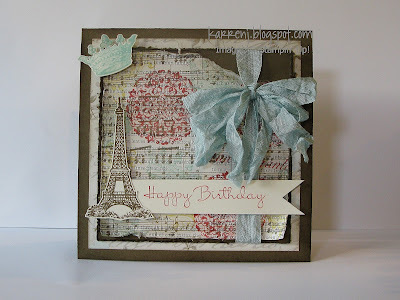 Jen Timko's gorgeous DT card on the SUO Challenges blog inspired me to use French Foliage for my card. 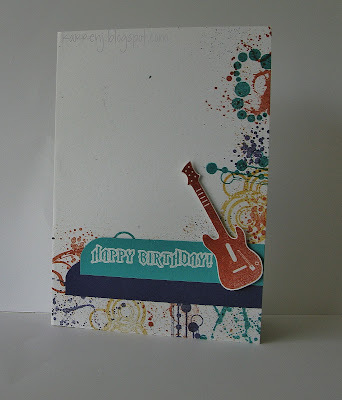 I used Crumb Cake for my card base and stamped layer and Midnight Muse between the two. I stamped the script and splatter images onto both the card base and stamped layer on the left hand sides. 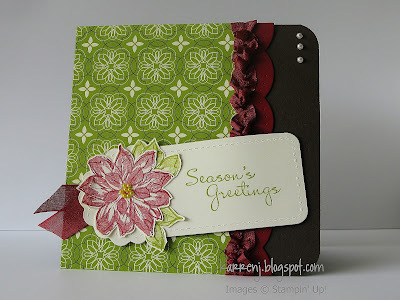 Using my stamp-a-majig I stamped the leaf image in Cajun Craze alternated with More Mustard. For the cut out leaves, I stamped in More Mustard then edged with my Cajun Craze marker. The sentiment was stamped in Midnight Muse.